This isn’t a “why did we sit through this?” reaction you might associate with the Al Wilson/Dawn Marie wedding or the Kennel from Hell match, because I can legitimately say #DIY’s finish was done perfectly. After losing a brutal ladder match for the NXT Tag Team Titles, the two long-time friends staggered from the ring and for a moment even I was fooled into thinking this was going to be their NXT curtain call and we’d see them showing up on SmackDown within the week. Instead, in a physically and emotionally brutal post-match segment, Tommaso attacked his tag team partner, releasing well-hidden and pent up rage that can be traced back to the summer of 2016. To add to the surprise the entire five minute-plus beating occurred after the copyright logo had appeared in the lower left-hand corner of the screen, which usually signals the end of the broadcast. That same trick was used at NXT: R-Evolution in December of 2014. The debuting Kevin Owens, covered in blood from an earlier botched spot with CJ Parker, came down to the ring to congratulate long-time friend Sami Zayn on his NXT title win. Then, after a genuine celebration with the full locker room, Owens returned, seemed to begin walking Zayn backstage, and then attacked him, throwing him into the ring and beating him down. But in this case, we hadn’t seen Owens and Zayn together in NXT, we could only go off of either a knowledge of the indies or the announce team talking about their friendship. We didn’t see them fight and support each other before the turn, whereas the #DIY turn happened after a match where Gargano took a sick ladder shot to the head to protect Ciampa. There were a lot of factors in the #DIY split that seemed to be great echos of previous team implosions from the past. One of the things that most struck me was how the split had been set up since last year’s Cruiserweight Classic, where Gargano and Ciampa faced each other in the first round of the tournament. After Gargano won the right to advance to the round of 16, Ciampa started to leave the ring, then turned back around and sat in the middle of the ring with Gargano, pulling his friend in for a hug and raising Johnny’s hand in victory. But there was still a look on Ciampa’s face, the question of if he was really all right with the ending of the match. After all, if he hadn’t hesitated with that padless knee-strike, the results might have been different. The idea that this slight had been stewing for months, with the only hint being a subjective read on the look on Ciampa’s face, actually brought to mind one of the most infamous blow-ups in WWE history: the explosion of The Mega Powers. The pairing of Hulk Hogan and “Macho Man” Randy Savage was the ultimate WWE star power team-up. But after a match at Survivor Series 1988, Hogan was friendly with Miss Elizabeth, and Savage just looked annoyed. That annoyance would simmer for months, with other miscommunications only making things worse, but it wasn’t until February 1989 on Saturday Night’s Main Event that everything fell apart. During a backstage promo, Savage pointed at Hogan’s face and screamed “Those eyes! Those eyes have lust for Elizabeth!” When Hogan protested, pleading with Elizabeth to “talk some sense into him,” Savage attacked Hogan from behind. The whole infamous break-up and feud was forecast by one look on Savage’s face during a post-match celebration. So reading more into Ciampa’s look after the CWC match wasn’t actually a bad idea. It’s the same sort of feel I get from rewatching footage from the break-up of The Shield. As Seth Rollins hoists the chair to strike Roman Reigns, there’s a feeling of “maybe this time he won’t hit him!” Like willing it not to happen can change the inevitable. Of course, the Shield break-up was more surprising in a number of ways. The timing was shocking, as the team had just come off of their biggest win ever against Evolution. 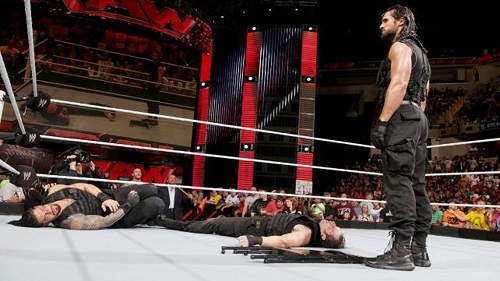 Beyond that, it was that Seth Rollins, the longtime peace-keeper of The Shield, was the one to turn on his supposed brothers, while every hint and indication had been that Dean Ambrose would initiate the split out of jealousy of Roman Reigns. Of course, that did seem to be the original plan, rumored to be lead to a US Title match between the three at Wrestlemania 30. But changes in the booking led to The Shield being kept together longer and a far more painful and somehow emotionally satisfying split. I mean, if you consider “my heart has been ripped out of my chest” a satisfying emotion. Which, given the reactions to the #DIY split, a lot of people do. If you rewatch the footage from the event in Chicago, you can see people in the audience somehow smiling during the attack. Obviously not because they wanted to see Johnny Gargano get beaten within an inch of his life, but because the whole thing played out so well. After all, it had the in-ring hug, followed by a walk up the ramp. Then, you could only see Tomasso Ciampa mouth the words “This wasn’t our moment…this is my moment,” before throwing Johnny into the LED set (he later revealed on Twitter what his exact words were). Then, following that first strike, Tommaso did what he couldn’t bring himself to do during their CWC match and struck Johnny with his exposed knee. Ciampa sat down while Gargano, utterly dazed, continued to reach for Ciampa in utter shock and confusion, as if he couldn’t comprehend what had just happened. Ciampa allowed this gesture, briefly, before picking Gargano up on his back and hitting him with a signature over-the-shoulder back-to-belly piledriver off of the announce booth and through a table below the stage. As heartbreaking as all these moments are, maybe we love them because it means that, no matter how briefly, we get to see what looks like genuine friendship in a wrestling ring. Maybe not with Hogan and Savage, but with The Shield, JeriKO, #DIY, and Owens and Zayn there is actual and organic camaraderie shown. Too often we see WWE fetishize the “Lone Wolf Against The World” archetype, as if the only sort of success that matters is the sort you get entirely on your own without burdens such as friendship. Look no further than the treatment of Roman Reigns in his post-Shield career, where he was even burdened with the catchphrase “One Versus All” despite the fact that his most likeable moments for months were when he was interacting with his friend Dean Ambrose. You have to wonder what sort of person would think an audience would identify strongly with the idea of friends being liabilities that you “owe” your success. Of course, it could also be simpler than that: it could be that we love the drama. After all, why else would we tune in again and again to our favorite promotion, no matter what it might be? Because either in ring or out of ring, we crave the ups and downs and most of all the beautiful chaos that is professional wrestling. Because when it hurts, it hurts so good. Ashly Nagrant is a former staff writer and concert photographer for Buzznet.com and her writing has appeared for Women Write About Comics, Sub-Cultured, LiveNation and more. She has appeared as a guest on podcasts for Nerds on the Rocks and Hard Times. One time she kicked a pigeon and she still feels bad about it. She doesn't really believe Artax dying caused your depression. Next → Next post: Deadshirt is Reading: Wonder Woman and Cable!